3 × = 12 Required Please enter the correct value. How Did the Stock Market Do Today? 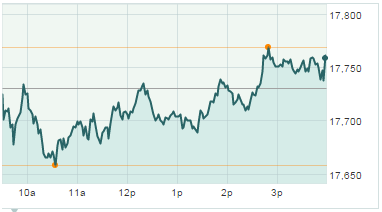 The Dow Jones Industrial Average today (Tuesday) added 27 points on a choppy day of trading. A gain in healthcare stocks was unable to fight off a more than 3% decline in Apple Inc. (Nasdaq: AAPL) stock. Investors also remain on watch as expectations for an interest rate hike by the U.S. Federal Reserve in December weighs on sentiment. In a surprise announcement today, Minneapolis Federal Reserve Bank President Narayana Kocherlakota, the most dovish policymaker on the Fed Open Market Committee, said he will not participate in the discussion next month when the central bank considers its first rate hike since 2006. According to CME FedWatch, the markets project a 67.8% probability the Federal Reserve will raise the benchmark rate from 0.25% to 0.50%. Tomorrow, markets will be open but U.S. banks will not in observance of Veteran's Day. Keep an eye on oil prices as the U.S. Energy Information Administration reports weekly crude inventories in the afternoon. Companies reporting quarterly earnings on Wednesday will include Macy's Inc. (NYSE: M), NetEase Inc. (Nasdaq ADR: NTES), Nordic American Tanker Ltd. (NYSE: NAT), Flowers Foods Inc. (NYSE: FLO), Popeyes Louisiana Kitchen Inc. (Nasdaq: PLKI), and Medifast Inc. (NYSE: MED). Stock Market News: Seven of 10 S&P sectors were positive today, with utilities largely leading the way. Shares of Duke Energy Corp. (NYSE: DUK), Exelon Corp. (NYSE: EXC), and Edison International (NYSE: EIX) were all ticking higher in the last 15 minutes of trading on heavy volumes. Meanwhile, Valeant Pharmaceuticals Intl. Inc. (NYSE: VRX) was the most traded healthcare stock on the day, falling another 2.1% as traders weigh news about the company's financial condition. Yesterday, activist hedge fund manager Bill Ackman, who is down more than $2 billion on his VRX position, came out and again said the stock presented tremendous value at current levels. That said, Money Morning Global Credit Strategist Michael Lewitt would disagree. Oil in Focus: Oil prices reversed a four-day losing streak. December WTI prices added more than 0.8% to hit $44.24, while Brent oil crude – priced in London – gained 0.7% to hit $47.52. Despite the rise in oil prices, the energy sector declined 0.1%. Shares of Exxon Mobil Corp. (NYSE: XOM) and Chevron Corp. (NYSE: CVX) were up more than 0.5% on the day. BRIC Blowback: Shares of Goldman Sachs Group Inc. (NYSE: GS) are up 7.3% since Oct. 23. One reason why may surprise you. As it turns out, the company quietly shuttered its BRIC investment fund last month, marking the end of an important era for the investment bank. Here's why: A challenging commodity and emerging market landscape. Square IPO: Shares of Square Inc. (NYSE: SQ) will hit the market on Thursday, Nov. 19. The highly anticipated tech IPOwill see a price range of $11 to $13 per share. Ask yourself: "Should I buy Square stock?" Stocks to Watch No. 2, DHI: Shares of R. Horton Inc. (NYSE: DHI) surged more than 8.2% after the home builder easily beat Wall Street quarterly earnings estimates. The firm reported earnings per share of $0.64, beating top-line estimates by $0.02. The company said it experienced a 19% jump in new orders and raised its dividend by 28%. Rival Beazer Homes USA Inc. (NYSE: BZH) also reported earnings, which saw a 495% gain to its Q4 bottom line. Shares of BZH were up more than 5.6% on the day. Stocks to Watch No. 3, TGT: Yesterday, Target Corp. (NYSE: TGT) launched its way-too-early Black Friday discounts two weeks before Thanksgiving. To get one step ahead, big box electronics retailer Best Buy Co. Inc. (NYSE: BBY) said it would launch its Black Friday deals in stores and online today. The company said it will also open its retail locations at 5 p.m. on Thanksgiving Day. BBY stock was down nearly 2% today. Stocks to Watch No. 4, GPS: Shares of Gap Inc. (NYSE: GPS) were off more than 1.4% today after the company stated its third-quarter earnings report – due next week – will come in lower than Wall Street expectations. The retail company said same-store sales fell 3% in October. Grab Double-Digit Gains from This Analyst "Fail"